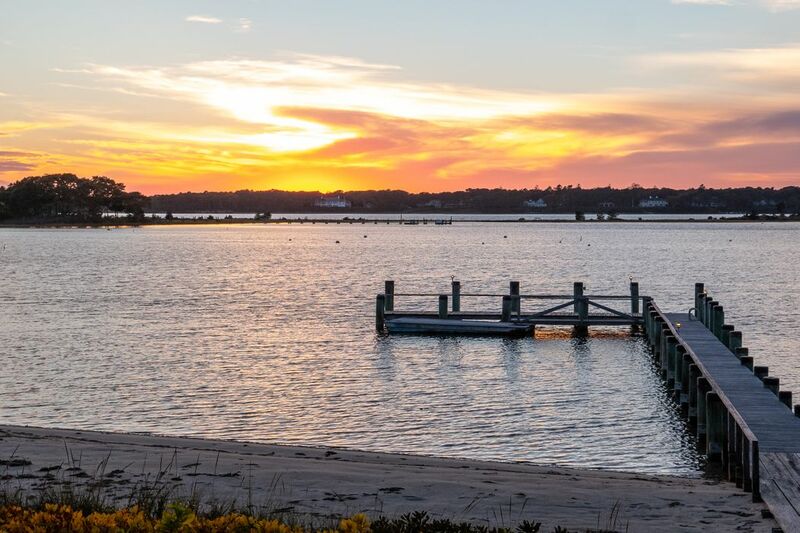 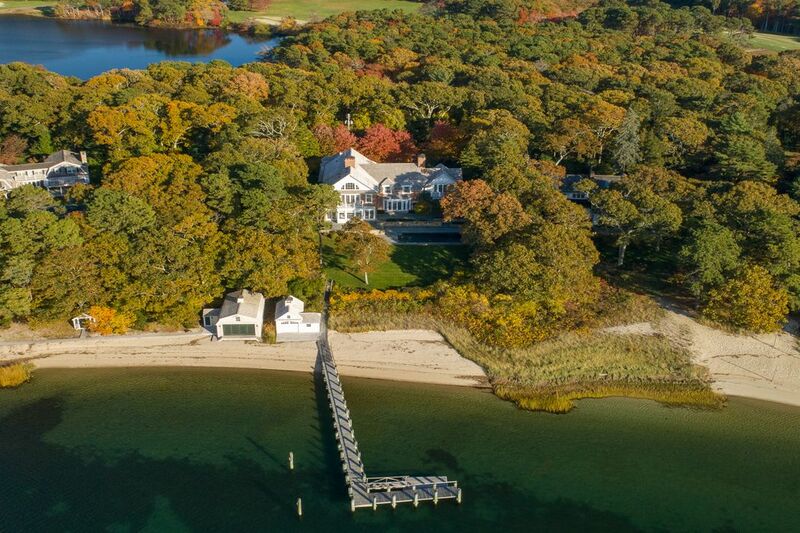 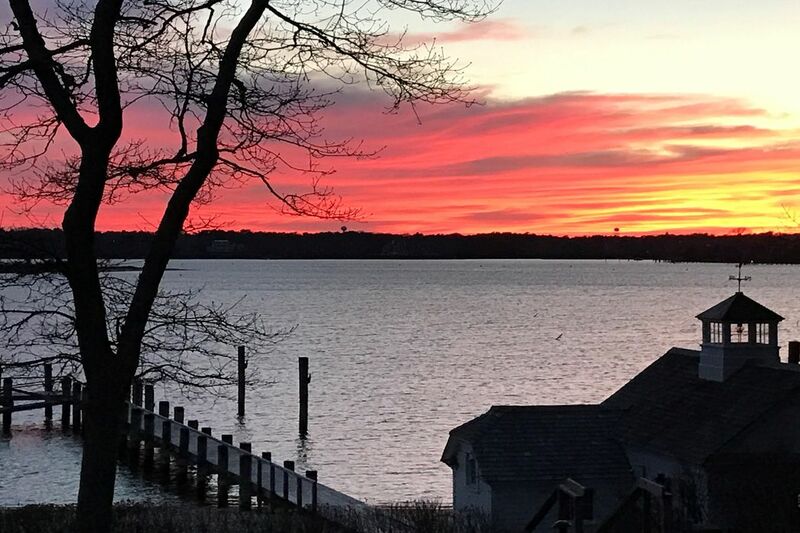 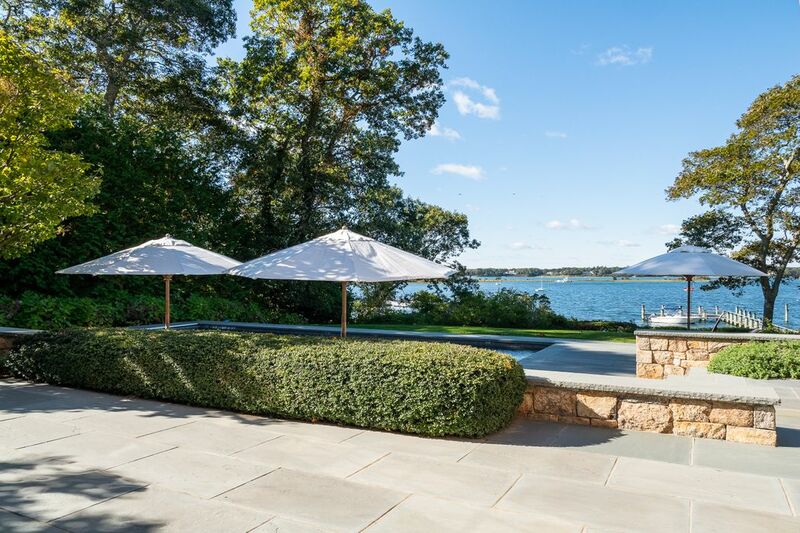 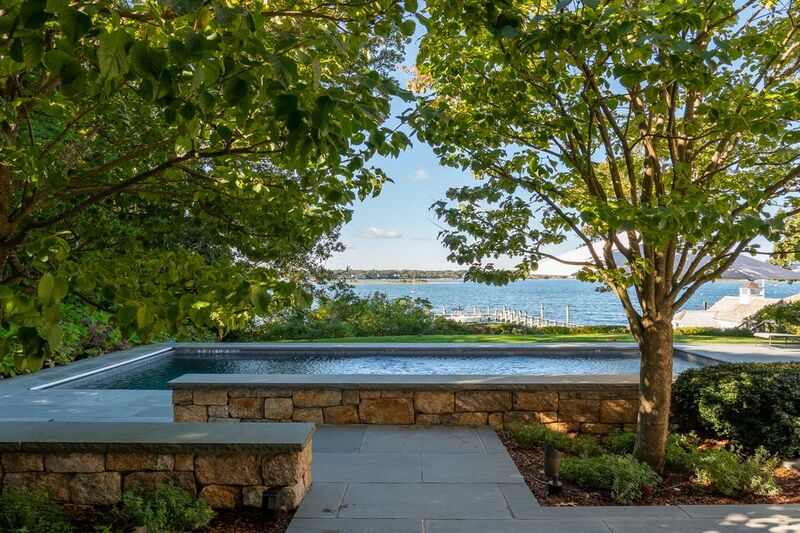 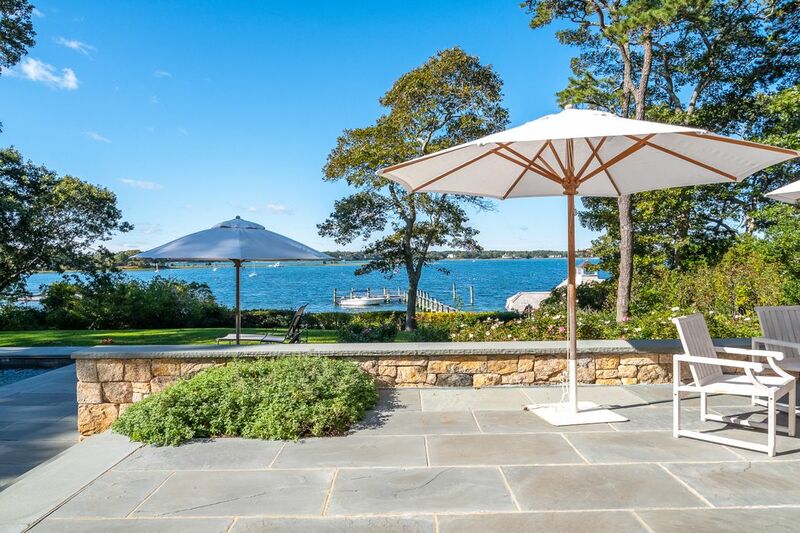 Point O' View Osterville, MA 02655 | Sotheby's International Realty, Inc.
$11,900,000 5 Bedrooms5 Full / 3 Partial Baths7,499 sq. 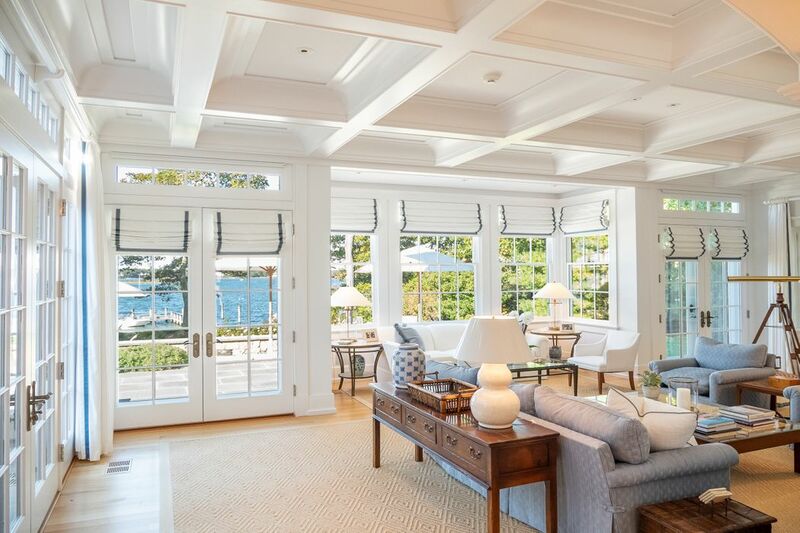 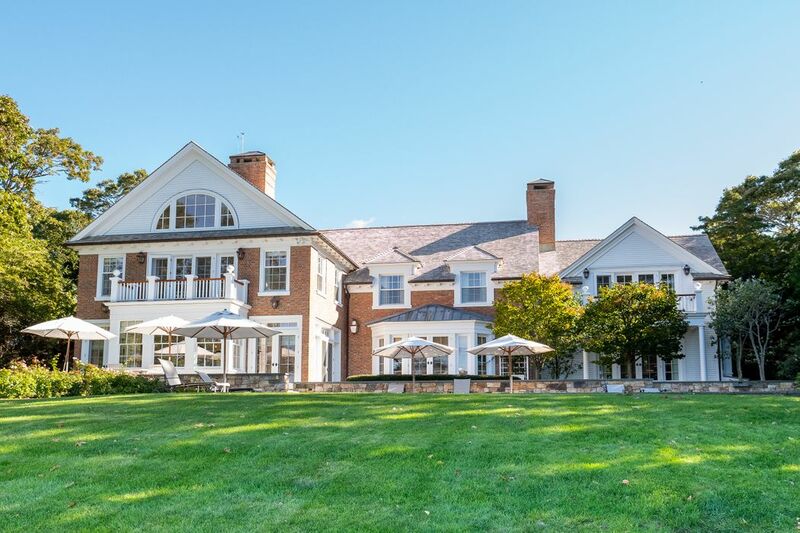 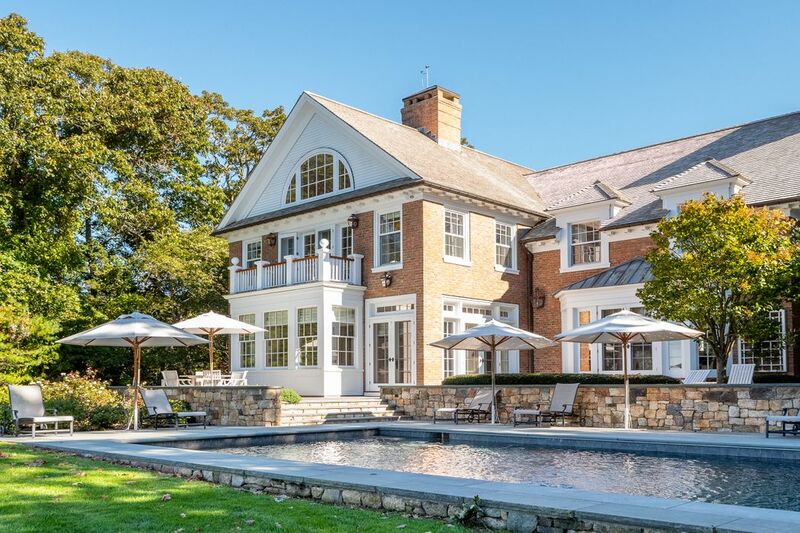 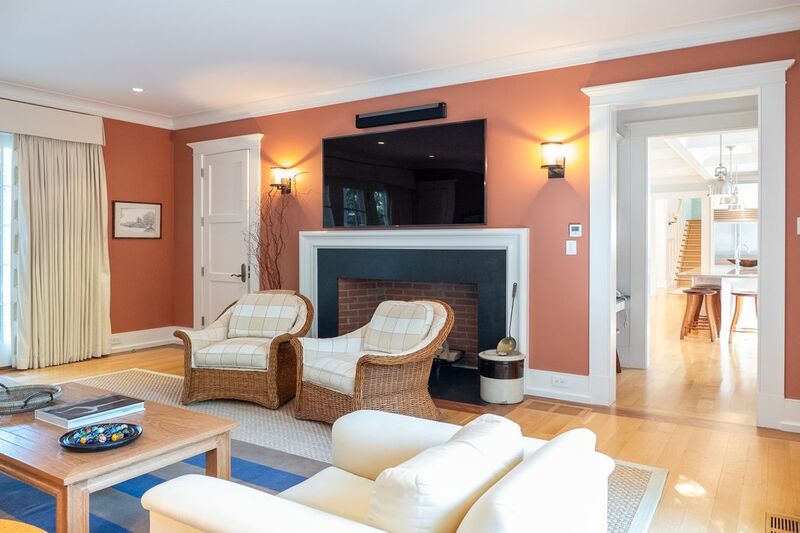 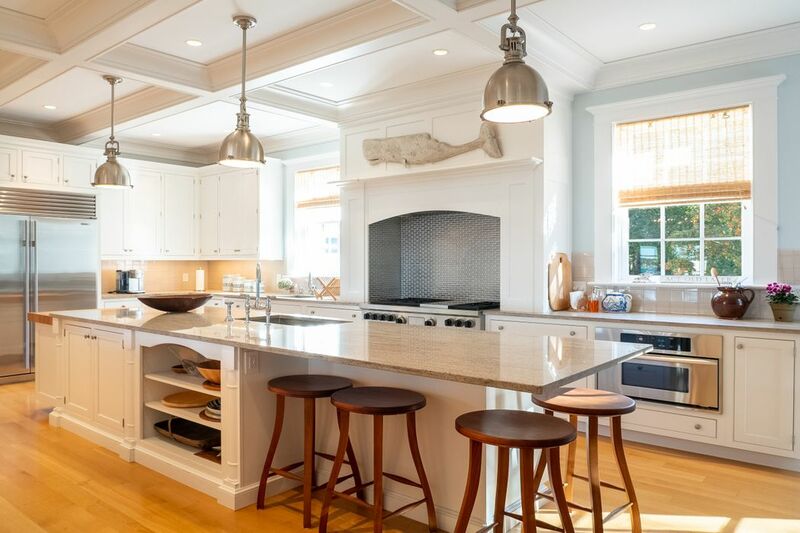 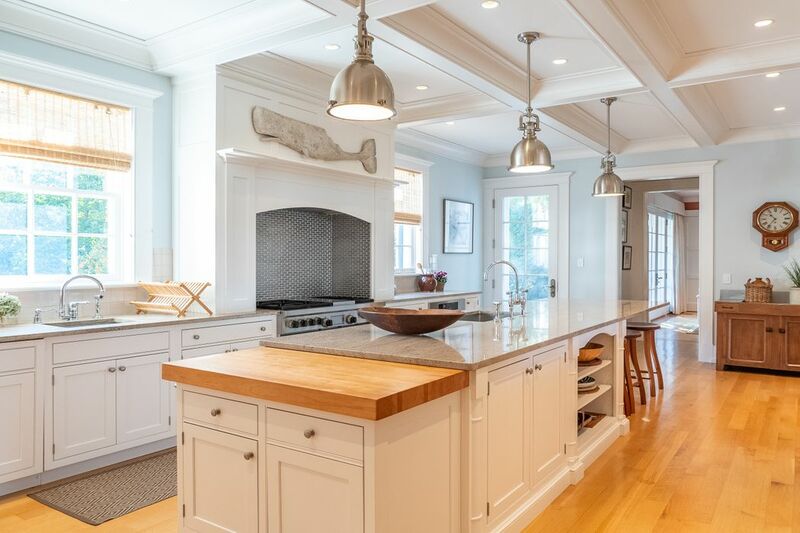 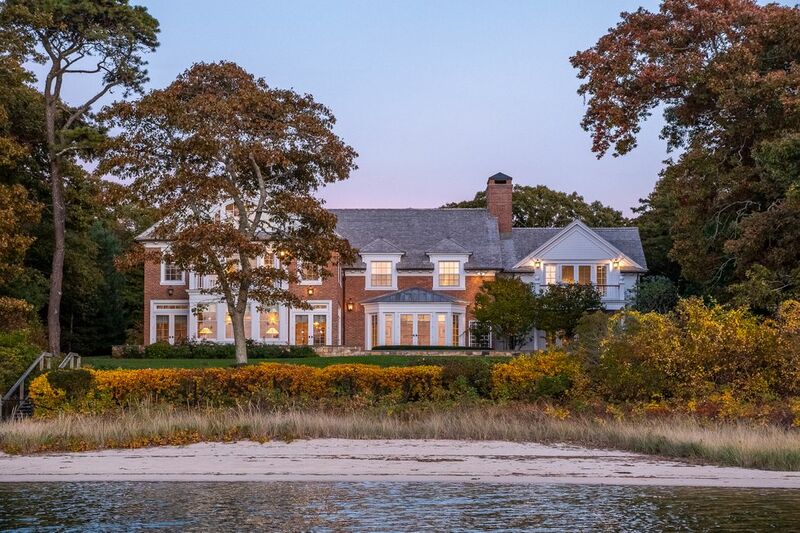 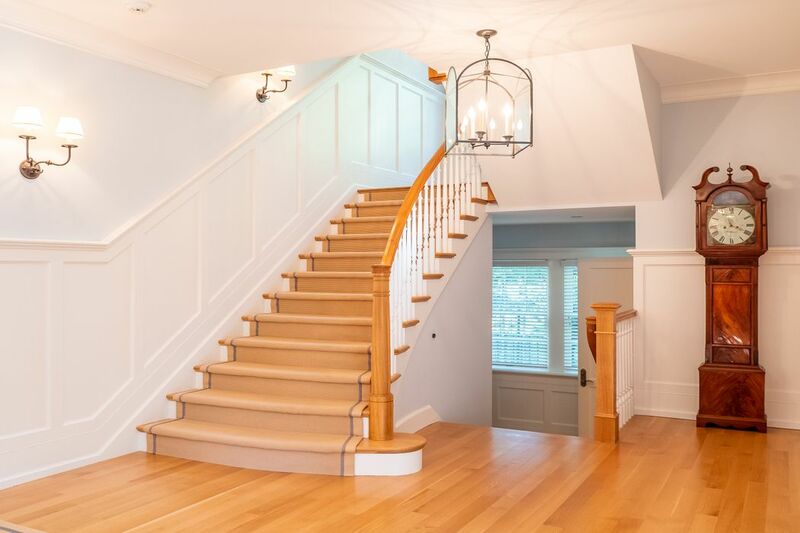 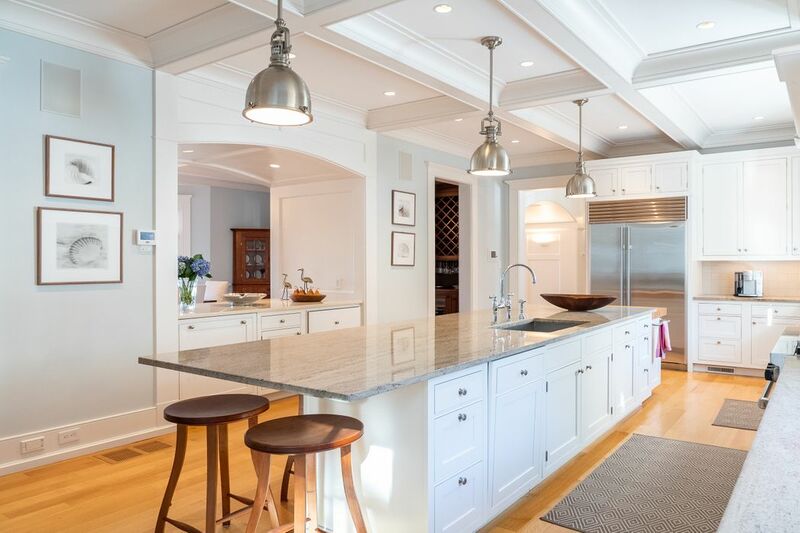 ft.
Point o’ View | Exemplifying classic East Coast Colonial style, this impeccably constructed 7,499-square-foot residence in Osterville is fondly referred to as Point o’ View, largely due its enviable position on West Bay, which offers serene views of the water, sunsets, and boats sailing by. 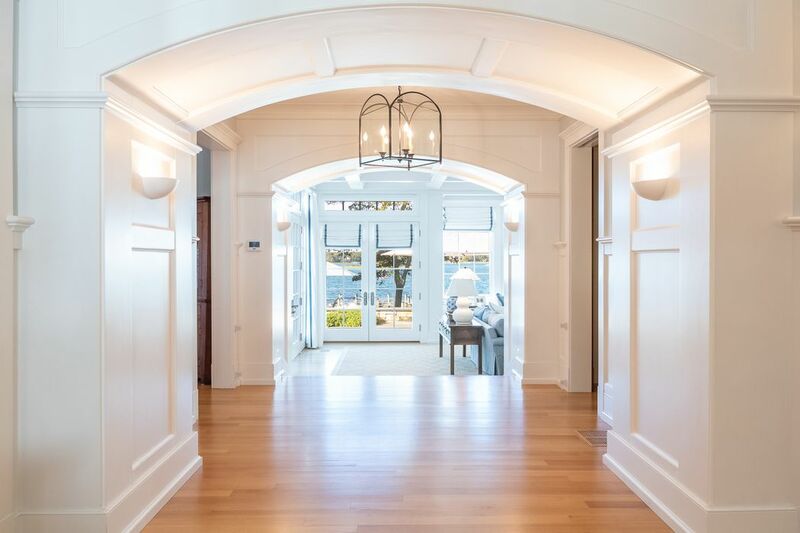 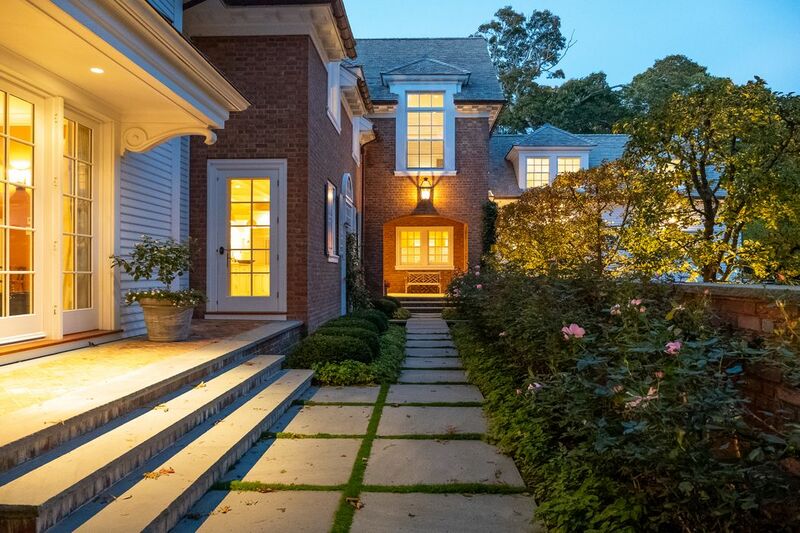 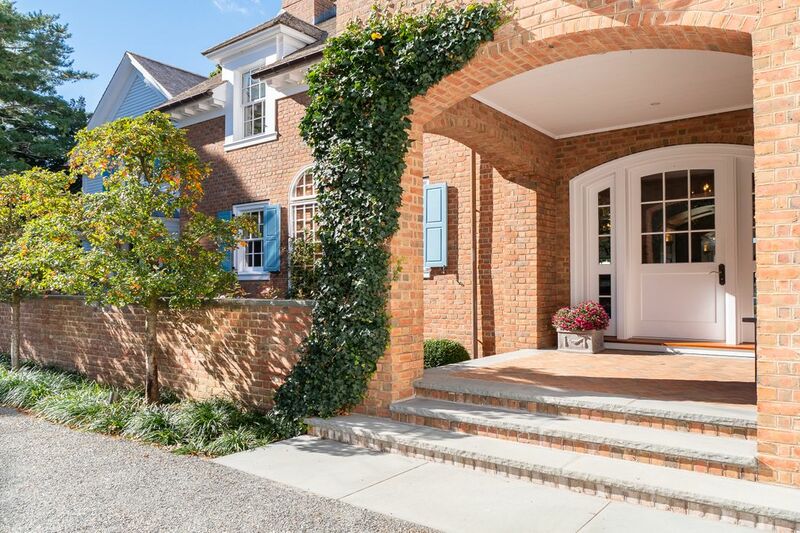 A traditional brick and clapboard façade with dentil moldings and dormer windows hints at the interior’s inviting, timelessly styled spaces, which boast soaring coffered ceilings, stately paneling, warm hardwood floors, and custom doors and wood-framed windows from British Columbia. 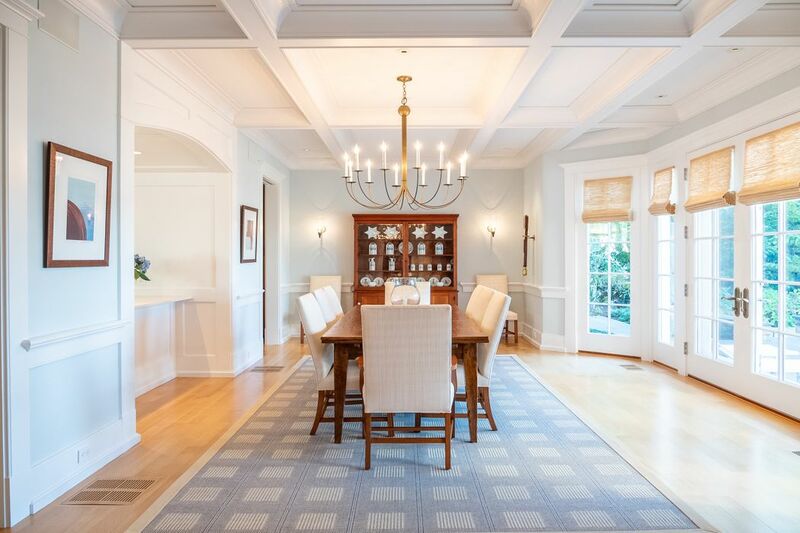 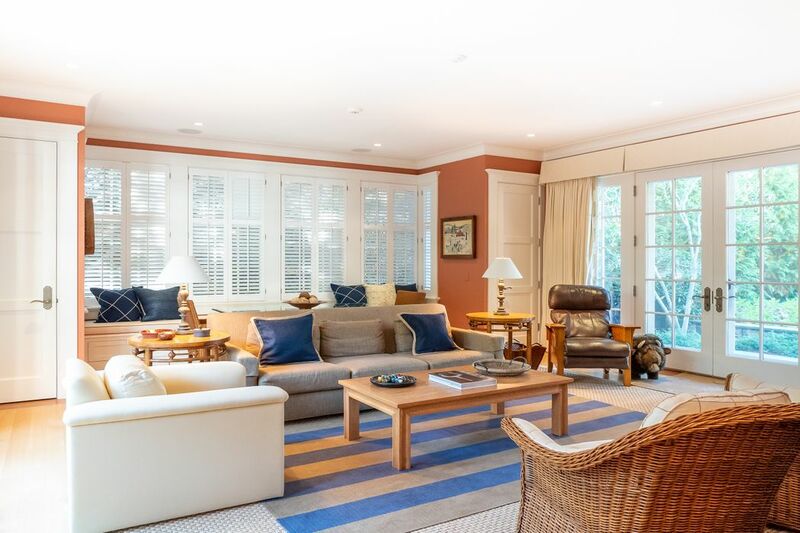 The living and entertaining areas include a light-filled formal dining room with French doors revealing views of the grounds, a study or den with a striking board-and-batten tray ceiling recalling the interior of a ship, a elegant living room enveloped by windows and French doors, a relaxing family room, and a spacious kitchen with clean lines, stainless-steel appliances, and an oversized island with granite and butcher-block countertops and seating for four. 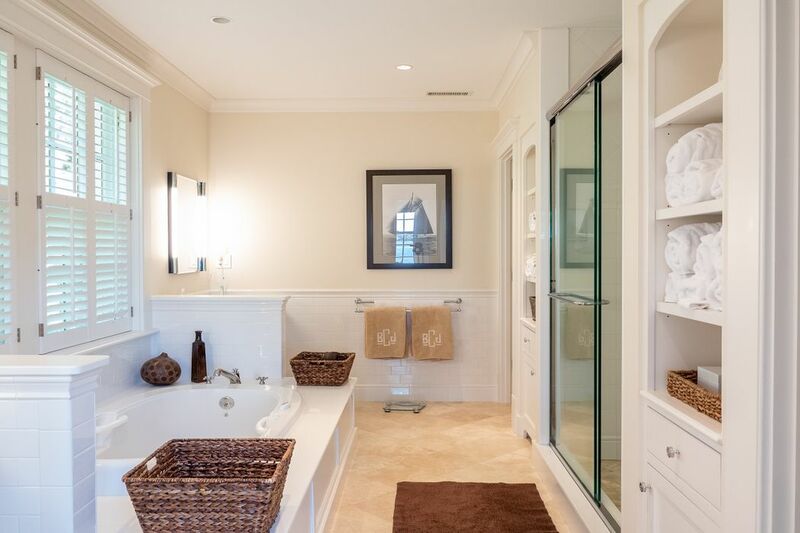 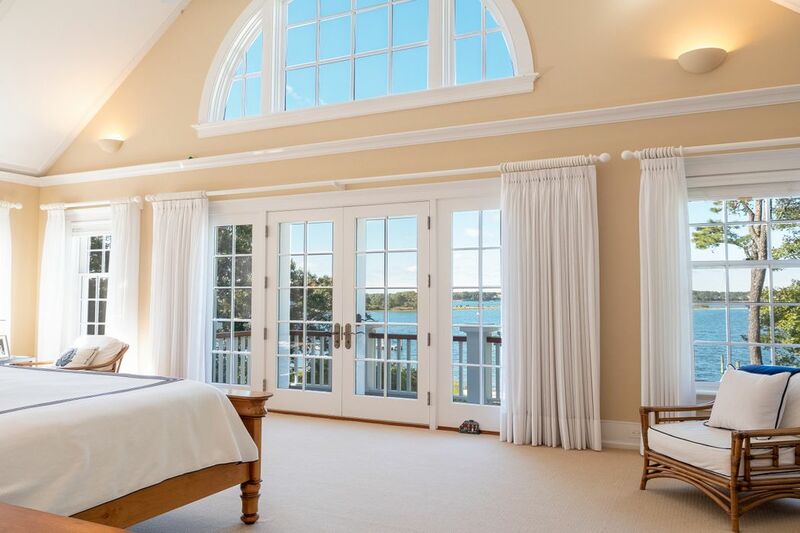 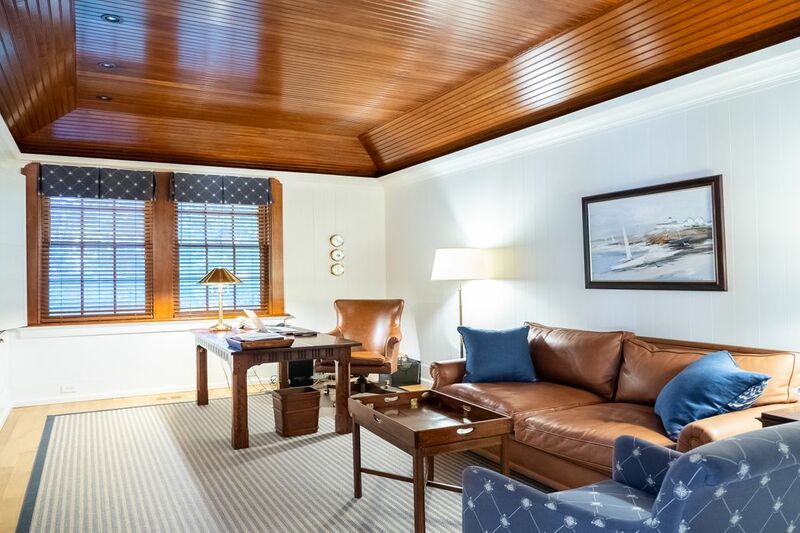 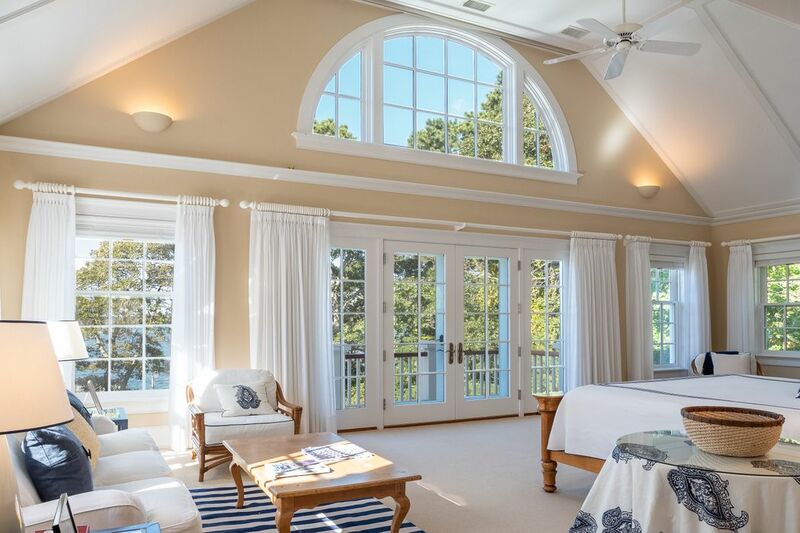 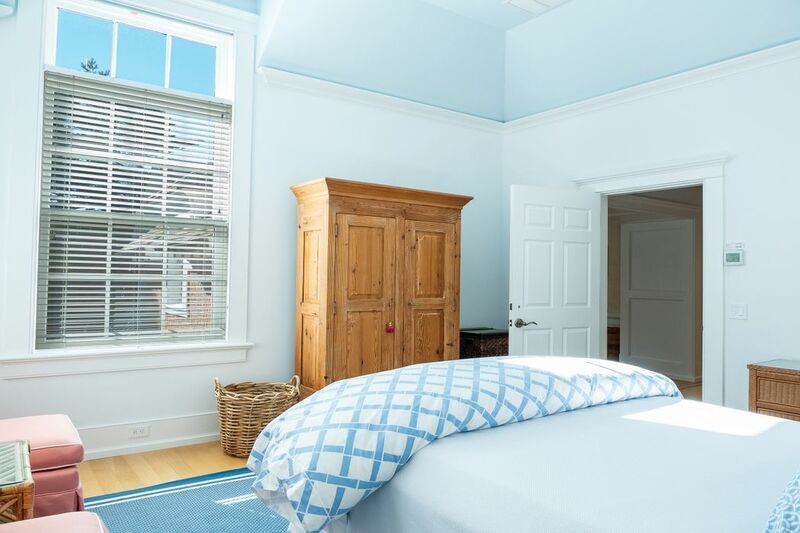 Of the five restful bedrooms, the master suite is roomy and open and features a dramatic Palladian-style window wall, a balcony overlooking the bay and the water, and a spa-like bath with a tub and a shower. 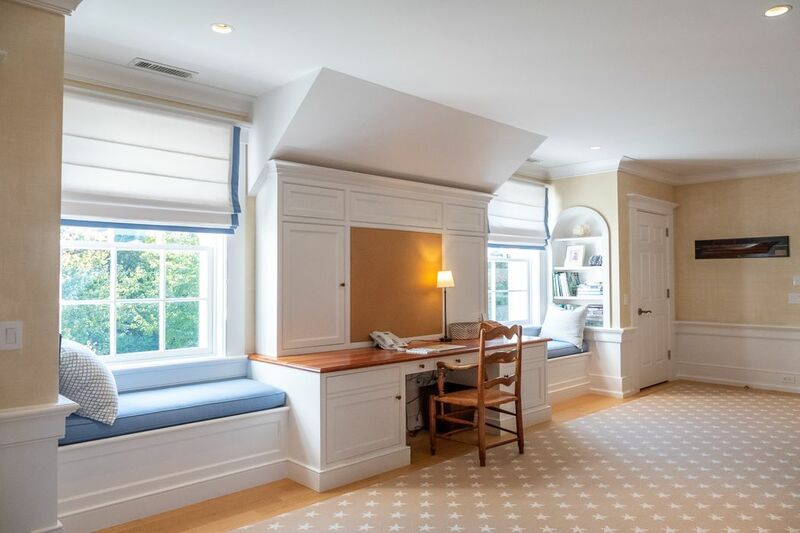 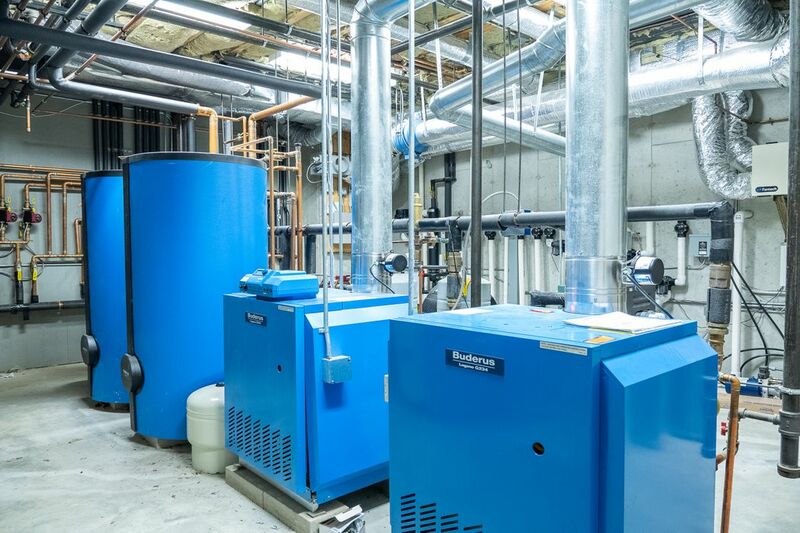 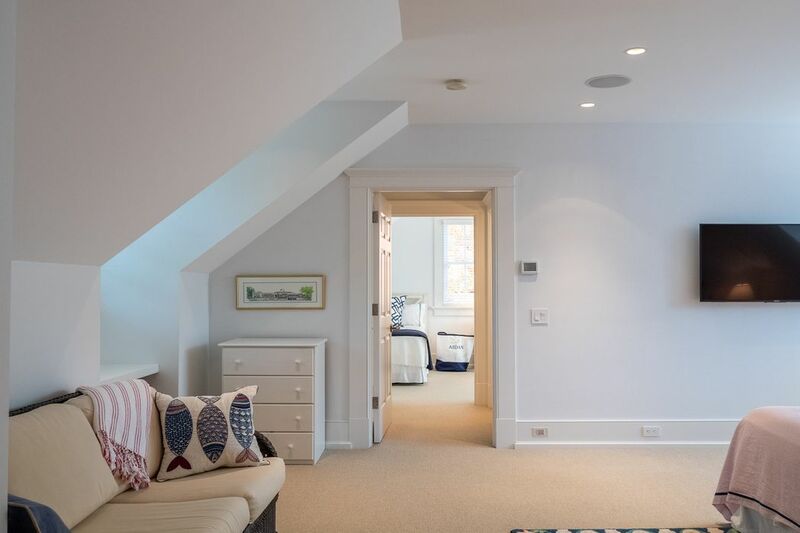 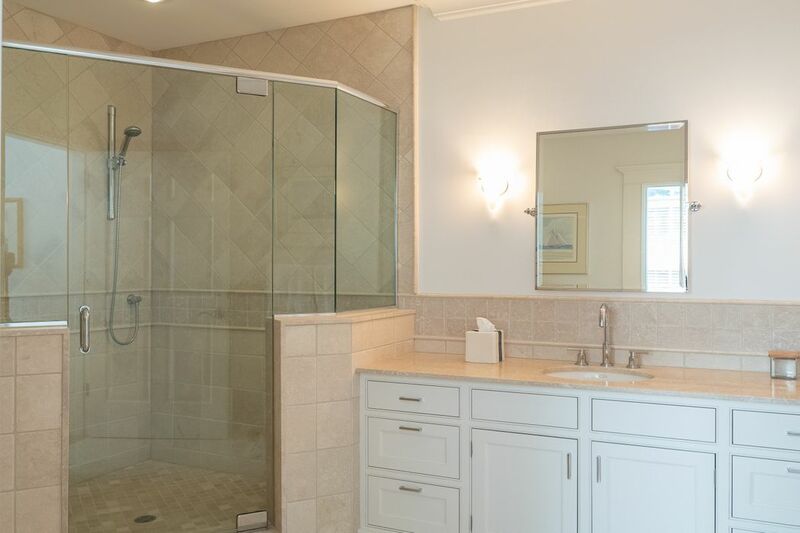 Among the numerous other amenities are a home office with a built-in desk, a security system, an outdoor shower, and a shaft prepared for the installation of a convenient elevator. 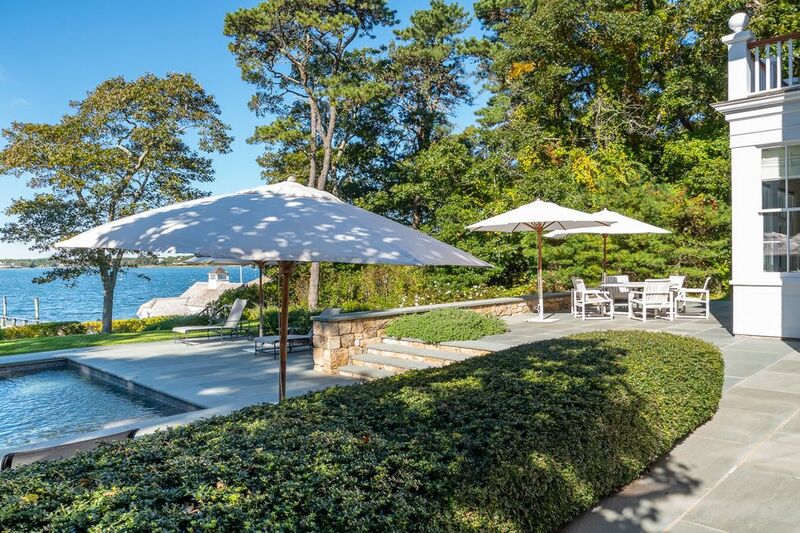 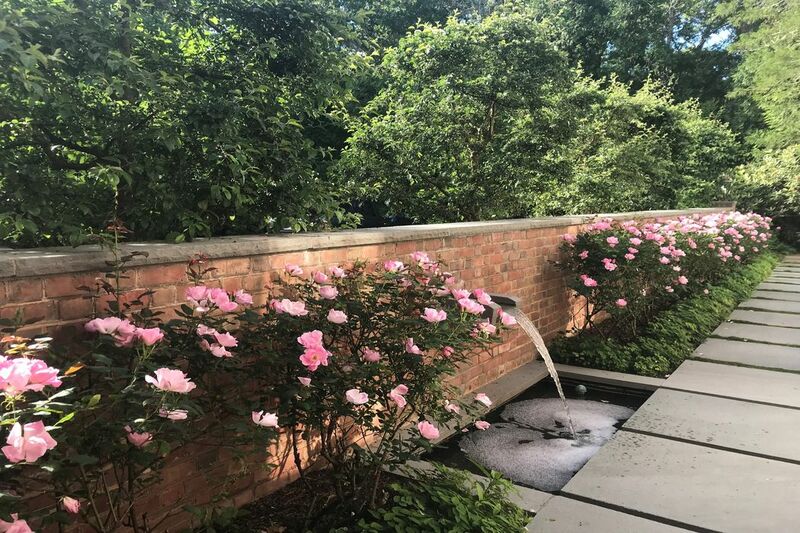 Recalling a soothing, sophisticated resort on a faraway coast, the .71-acre grounds include established roses, manicured hedges, a multilevel blue stone terrace with space for living and dining, a refreshing swimming pool in the cool shade of mature trees, a swath of green lawn that cascades toward the water, a private sandy beach, a 38-foot dock, and a boathouse.